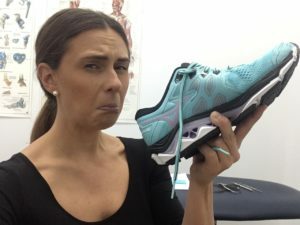 Sports Podiatry | Got Stinky Feet? We Can Help! Got Stinky Feet? We Can Help! 10 Apr Got Stinky Feet? We Can Help! Its embarrassing, it stings the nostrils! Bad foot odour can be conquered and here is how…..
Bacteria can thrive in moist and hospitable environment of your shoe. They can stick around on your foot, snacking on skin oils and dead skin cells and before long, they are having bacteria babies and you’ve got yourself a foot odour problem! Even bacteria need to go to the toilet after eating up all that delicious dead skin, if they survive that long. They eliminate waste in the form of organic acids. That’s the reason even your clean feet can smell badly, yep, bacteria poo. 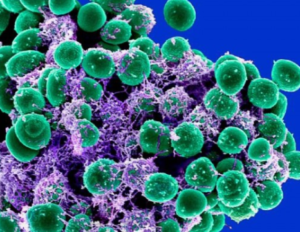 Not all bacteria are equal…Kytococcus sedentarius has a particularly nasty rotten egg stench while staphylococcus epidermidis is responsible for anything cheese-like or musty smell. Yummo! Hormones: Teenagers, pregnant ladies, pre-menopausal/menopausal women, sorry it’s a sweaty time for you. Genetics- thanks mum and dad. Diet: of course it is all of the good stuff like alcohol, coffee, garlic/onions, spicy food and fizzy drinks that could be contributing. Don’t have too much of a good thing. Exercise: Goes without saying really. Heart rate rises, sweat increases. Wash your feet every day using antibacterial soap. Always keep your toenails clipped and clean. Dry feet thoroughly after showering. As added insurance, wipe down your feet with an alcohol wipe to close up your pores and reduce sweating temporarily. Do this before you put on your socks and shoes for the day. Use a foot deodorant or antiperspirant. It is the same idea as getting rid of smelly (arm)pits. Antiperspirant works by plugging up your pores and blocking sweat. By blocking the sweat, it can also prevent bad foot odour. Clinical strength antiperspirants can be very effective in treating hand and foot sweating. Wear socks, wear the right socks and change them daily! Avoid nylon socks and go for the organic fibres like cotton, wool and bamboo that wick the moisture way from the skin = dry, cool feet. There are socks out there with silver/copper impregnated fibers that also boast antibacterial properties. We like bamboo. Before washing, turn socks inside out to shed dead skin flakes. Don’t wear the same pair of shoes two days in a row. Let them air and dry out in the sunshine. Wipe out your shoes, or use anti-bacteria powders and sprays. It’s time to remind any bacteria that have set up shop its time to leave. Choose leather and canvas shoes over synthetics or shoes with ventilation when its hot. Sandals and thongs are more popular in hot climates for a reason. As long as floors are clean, go around barefoot and let those feet breathe. Exfoliate Feet. Exfoliation is the process of removing dead skin cells from your body. Odour causing bacteria love to feed on these dead skin cells. Use an exfoliating brush or glove on your feet 2-3 times a week to help keep bacteria away. Baking soda or Corn starch: Sprinkle in your shoes. Use to absorb sweat and keep the feet dry like foot powders. Baking soda will even kill some bacteria to neutralise the odour. Lemon Juice: Use cotton balls to apply fresh lemon juice to the soles of your feet before putting on your shoes and socks. It helps to close your pores and prevent sweating. Lemon juice can also work as a natural deodorant. Tea Foot Soak: Soak your feet in tea for half an hour daily – for a week – letting the tannic acid work its magic. Just add 4 – 5 tea bags to a litre of boiling water. Once cooled, soak your feet for 15-20 minutes. Some report that drinking the tea can also be helpful in combating foot sweat. Soak feet 20 minutes a day in ½-cup kosher salt per litre of water, don’t rinse and dry thoroughly with a clean dry towel. Try 1 tablespoon baking soda per litre of water and soak for half an hour 30 minutes as many times as you like. What if that doesn’t work?? If you’ve tried the various antibacterial remedies to stop the stink and all have failed, it’s time to look elsewhere. Too often, the diagnosis is Athlete’s Foot or Tinea. The good news is that Athlete’s Foot isn’t a bacterial problem; it’s a fungus-based infection. Think mushrooms. Not actual mushrooms, but fungus. This a super common condition that also invades skin that’s perpetually warm, moist and irritated. The tell-tale signs are easy to detect – burning, stinging, itching, redness and flaking – especially between toes where moisture accumulates. Athlete’s Foot is contagious so don’t share linens and whatever you do, don’t share shoes or socks. 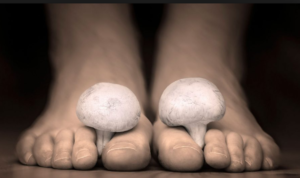 There are lots of over-the-counter remedies for this fungal infection, but if nothing works, head to a doctor or podiatrist because the infection is likely to slowly get worse leading to open lesions, oozing, crusty blisters and it can spread to your nails. If antiperspirant doesn’t stop foot perspiration, Iontophoresis might be a good option. It’s been used for over 50 years to treat excessive sweating of the hands and feet. Iontophoresis works by using electrical currents to drive medication into the skin surface. It’s similar to an injection, but without the needles. Iontophoresis machines can be purchased and used in home. (cost ranges from $400-650 AUS) There are skin clinics around the place that offer the service too. Botox injections temporarily block the chemicals that activate the nerves that cause sweating. Affected areas of your feet will receive enough injections to ensure that all the nerves have been treated. The desired effects will last 3-4 months. Then treatments must be repeated. Botox injections for plantar hyperhidrosis (excessive foot sweating) can be painful.